Your car’s suspension is made up of a variety of parts that can cause problems when they wear out or become damaged. 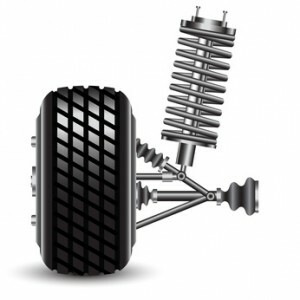 The main two components are shocks and struts. As shocks and struts start to become worn, it can not only make for a bumpy ride, but increase your braking distance on rougher road surfaces. This can even cause “body sway” causing your vehicle to lean when switching lanes or making turns. Our ASE certified mechanics provide expert suspension repair service in Rancho Santa Margarita. Aside from shocks and struts, the issue could also be a result of damaged or worn out control arms, sway bar links, control bushings or ball joints. If you hear a clunking or popping noise when you hit a bump, this could be a worn ball joint or one which is not lubricated properly. The rubber bushings can also make these sounds when they start to harden, but they can easily be replaced. When you start to notice troubles with your car’s suspension it’s a good idea to have it looked at by a seasoned mechanic. Our professional suspension repair mechanics in Rancho Santa Margarita can help! Our shop has been serving the South Orange County area since 1987, delivering affordable and dependable service for cars, trucks and SUV’s. Drop by or call us today! We look forward to serving you! Does your car bounce when hitting bumps in the road? Does your car sway or lean to one side when turning? Does the front end of your car dip when stopping? experts are highly experienced with.